601S - Black frame and grey lenses. 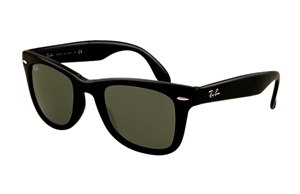 The Ray-Ban RB 4105 is a folding Wayfarer, that comes with its own pocket pouch to keep the sunglasses in!. Very compact and great for convenience. The Ray-Ban RB 4105 comes with its own branded pouch, cloth and packaging, and covered by the 12 month no quibble sendoptics guarantee. 601/32 - Black frame and graduated grey lenses. 710/50 - Brown tortoiseshell frame and brown lenses. 710/51 - Brown havana frame and graduated brown lenses.